1. My main reason is because I had gone two weeks without seeing my other half, due to a huge work commitment, so we had a date night, which was our usual Blue Monday at Yo!Sushi. 2. It was sign offs and I knew I wasn't going to try for them until I'd been on the track. 3. I'd gotten a new tattoo on the Sunday so it was still very tender. 4. I went skating later on this week, so therrrrrrrrre! At the weekend, I donned my t-shirt and name necklace and went to represent the Brawds at our local tattoo convention. We met loads of lovely people, all who seemed very interested in roller derby and who did end up joining fresh meat on the Monday (I heard that 12 newbies turned up! Woohoo!) and some who we educated on derby as they'd never heard of it! Tattooed by Anna at Adorn Studio - I absolutely adore it! It's perfect and it sums up my derby experience so far and what I hope to come. If I had given up on my first week, if I had quit when I felt that I was terrible and when I was terrified, then I wouldn't be here! I tend to be one of those people who, if I can't do it from the start, then I will quit. But I chose not to. I gave myself a mental slap and went back and, even though I fell, I went back again and again and have worked hard and am improving every session. So whenever I feel like I've had a terrible practice, I will look at this and I will remember what got me here. Another derby treat to myself was new skates! Woohoo! I knew I would have to grace the track with the proper skates, so I bought skates (Riedell R3s - perfect for my skinny feet), new wheels (Rollerbones, Day of The Dead, 92a - not to grippy for our our already pretty grippy track, but not so hard that I'll land straight on my bum!, and some toe-stops (Gumballs). 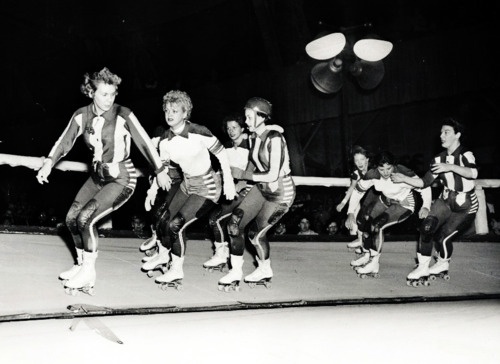 I decided to try them out before I start on the track, so I took them to our local roller disco. Unfortunately, there was a mix-up with my order and they had sent me the wrong wheels, so I had to skate on the wheels the skates come with, which are very hard. It was terrifying. I would say it was like starting again, but I couldn't even move when I started, so it was more like being knocked back a few stages. 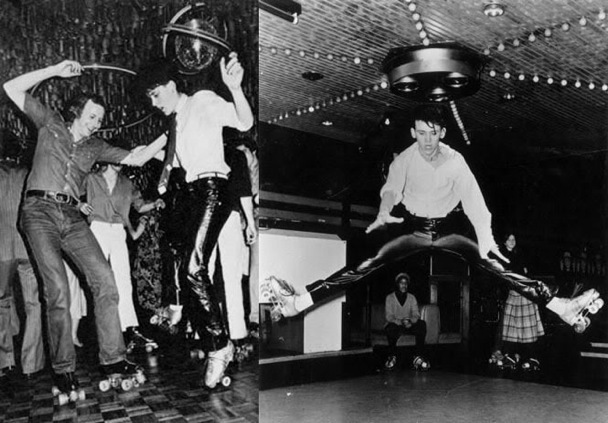 I'd got so used to my super grippy disco skates, that I was not at all prepared for the slipperiness of these wheels! Also, as I had lowered my toe-stops to the suggested length (when up on your toe stops, your back wheels should be 2 fingers off the ground) I was convinced I kept catching them if I kicked my foot out wrong, which jolted me and sent me straight into the drilled derby stance, double knee fall position. Thankfully, I didn't actually fall! Despite all of that, I do love my new skates and I'm hoping that, once the right wheels arrive, I will soon get back in to the swing of things. Main track, I'm ready for you. With regards to kit, I would totally recommend talking to one of your coaches. Mine managed to help me try and get my head around wheels and taught me a lot of things while melting my brain a little too! She is my wheel guru now, though, and I hope to learn her ways! Loving reading your blog! I've been trying to get up the confidence to come along to Fresh Meat for a few months now and have decided I'm going to make myself do it! Reading your blog has really helped too as I've not been on skates for a loooooong time! I'm so pleased it's helped you! Everyone's so lovely that you'll feel right at home from your first session. Week 11: It's Getting A Little Crowded!